Every bite of Montego Classic for adult cats is a bit of delight. Montego Classic for adult cats is perfectly balanced, thoroughly satisfying and highly digestible nutrition for your pets. Most cats are active and inquisitive, and therefore their diet should contain a mix of fats, proteins, minerals, vitamins and amino acids to support their lifestyle. Montego provides everything pets of all ages and their owners throughout South Africa rely on for everyday energy, wellbeing and happiness. Montego Classic Adult Cat is formulated to meet your furballs needs as an adult cat. Montego is made right here in South Africa and has all the right nutrients South African Cats need. Montego Classic Adult Cat contains 41 nutrients that will keep your cat active, happy and healthy. What is Montego Classic Adult Cat? 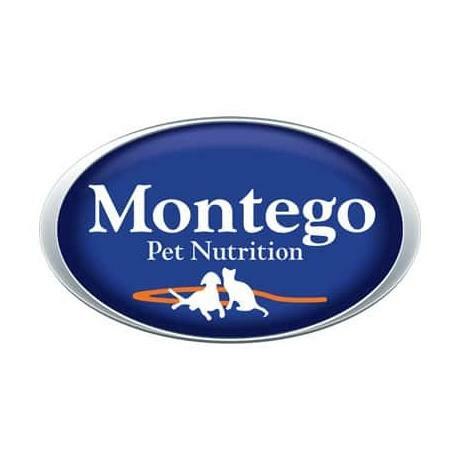 Montego Classic Adult Cat is a perfectly balanced, highly digestible food for your adult cat. Montego Classic Adult Cat food is perfectly balanced, thoroughly satisfying and highly digestible nutrition for your pets. Montego Classic Adult Cat food contains 41 nutrients that are found in its mix of proteins, carbohydrates, fats, minerals and vitamins to keep your cat healthy and strong. Montego Classic Adult Cat food is made with real meat for bioavailability and optimal nutrient absorption. Your cat will benefit from the Vitamin E and A, as well as the Bioflavonoids (antioxidants) that will strengthen your cat’s immunity. Furthermore, this cat food contains ingredients to support joint health and good eyesight. Which ingredients are used in Montego Classic Adult Cat food? Montego Classic Adult cat food has high-quality proteins derived from chicken and fish which help to build and maintain strong muscles. The combination of high quality, natural sources of both soluble (beet pulp) and insoluble (wheat bran) fibres, promotes optimal nutrient absorption and digestive health. Soluble fibres balance the good and bad bacteria in the digestive system and function as a prebiotic and secondly for the fibre to be absorbed into the digestive system and aiding the cat’s metabolism. Montego Classic Cat food has Taurine which is an essential amino acid that cats require to help maintain both heart and eye health. Montego Classic Cat food contains L-Lysine for healthy growth and bone development, L-Carnitine for increased fat metabolism and enhanced endurance; and DL-Methionine for Keratin (hair protein) synthesis. The Antioxidants, Vitamins and minerals in Montego Classic Cat food help boost your cat’s immune systems keeping them healthy and strong. Their skin is nourished by a balance of Omega 6 and 3 fatty acid making sure their coat is soft and shiny. Montego Classic adult cat food contains added glucosamine and chondroitin for joint support. 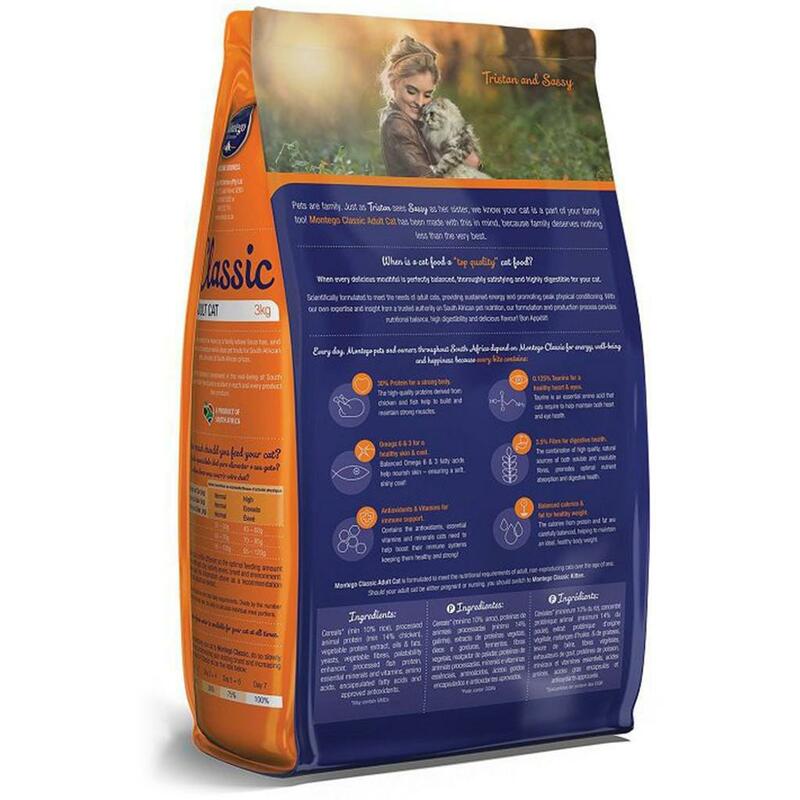 Montego Classic Cat food has no artificial flavouring or colourants. It provides your cat with a balanced diet that will help to improve their flexibility and eyesight and provides them with healthy skin and coat and lots of energy – the deliciously wholesome food your cat deserves. From what age can my cat eat Montego Classic Adult Cat food? Montego Classic Adult cat food is recommended for adult cats from the age of 12 months to 7 years of age. What size bags does Montego Classic Adult cat come in? 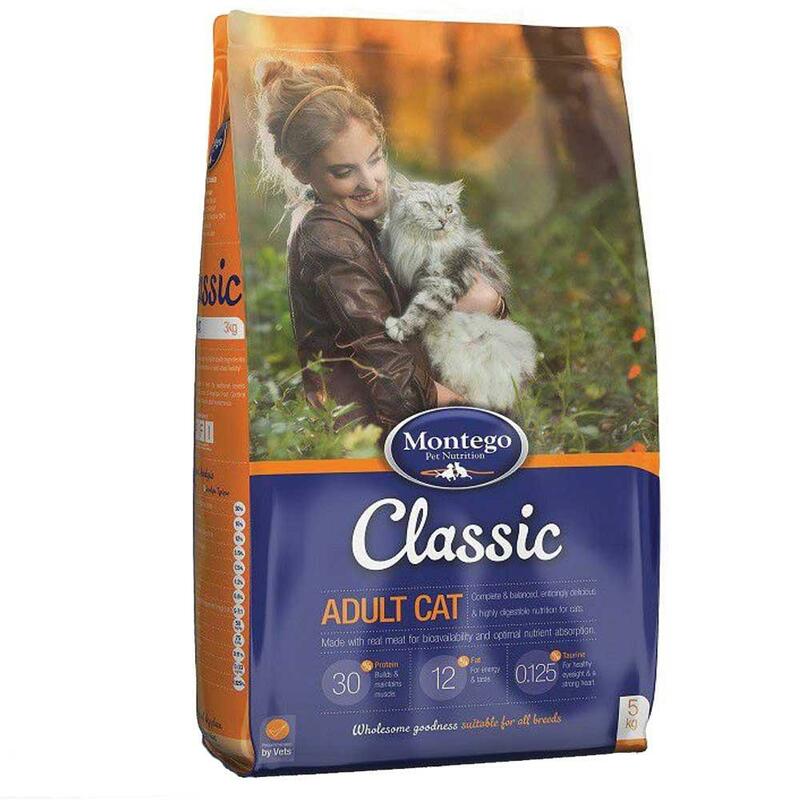 Montego Classic Cat food is available in 1 kg, 3 kg, 5 kg and 25 kg bags. What makes Montego different from other pet foods? Montego Pet Nutrition manufacturing facility, production processes, products and food safety management system comply with all international standards and are among the very best in the world. Montego Classic Adult Cat food is recommended by Vets. What is the best way to store your Montego Classic Adult Cat food? Always keep the cat food in the original packaging. Cat food bags are designed to keep out the elements and maintain its freshness. It also has the benefit of retaining the food’s barcode, expiration date and batch code – especially in the event of a recall. Seal the cat food bag after every use to help prevent exposure to air and humidity. Both of which speed up the rate at which foods degrade. Do not store Montego Classic Adult Cat food in the direct sun. Keep the cat food bag with its contents in an airtight bin or bucket. 30% Protein for a strong body The high-quality proteins derived from chicken and fish help to build and maintain strong muscles. 0.125% Taurine for a healthy heart and eyes Taurine is an essential amino acid that cats require to help maintain both heart and eye health. Omega 6 & 3 for a healthy skin & coat Balanced Omega 6 & 3 fatty acids help nourish skin – ensuring a soft, shiny coat! 3.5% Fibre for digestive health The combination of high quality, natural sources of both soluble and insoluble fibres, promotes optimal nutrient absorption and digestive health. Antioxidants & vitamins for immune support Contains the antioxidants, essential vitamins and minerals cats need to help boost their immune systems keeping them healthy and strong! Balanced calories & fat for healthy weight The calories from protein and fat are carefully balanced, helping to maintain an ideal, healthy body weight. Feeding (food and water), sleeping/resting, and litter box areas should be separate from each other. Ideally, each cat should have its own food and water ‘station’, preferably in a quiet, low traffic place where the cat likes to spend time. Water bowls should be wide and shallow; water should be fresh daily. Many cats eat more readily from shallow bowls or plates, so their whiskers don’t touch the sides. Ideally, place food and water bowls separate from each other. Food and water dishes should be kept clean. Measure the food allotment for each cat according to the amount recommended, monitor daily food intake and appetite. Cereals* (min 10% rice), processed animal protein (min 14% chicken), palatability extract, oils & fats, yeasts, vegetable fibres, palatability enhancer, processed fish protein, essential minerals and vitamins, amino acids, encapsulated fatty acids and approved antioxidants.